Designated a national treasure in 1966. 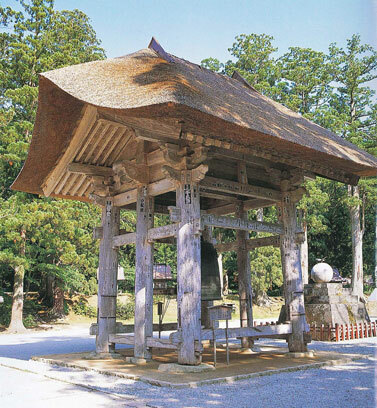 This is the oldest pagoda in Tohoku and is said to have been built in the Heian Period (903–940) by Taira no Masakado. The pagoda standing today is thought to have been largely renovated approximately 600 years ago by Masauji Muto　the feudal lord of Shonai at that time. Standing 29m tall, the wooden pagoda has a 3ken (1ken=1.8m; counter used to number the gaps between pillars), five-story construction. Although it was originally a reliquary built to house the cremated remains of Buddha, the pagoda enshrined the Buddhist deity of mercy, Kannon. Today, it enshrines the deity, Okuninushinomikoto. 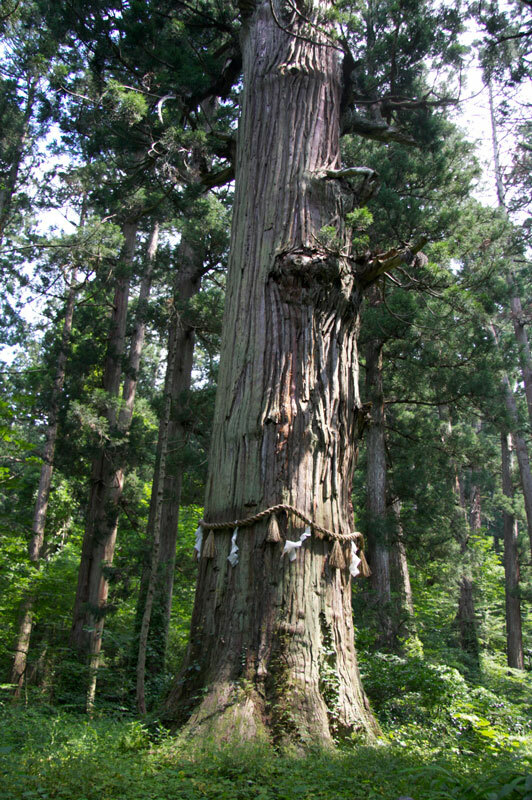 Nearby is Jijisugi, an ancient Japanese cedar tree 1,000 years old and 10m around that has been designated a national natural monument, and rows of cedar trees dating back 350–500 years that are special natural monuments. Designated a national treasure in 1929 and a national important cultural property in 1950. This Buddhist temple belongs to the Hagurosan Kotakuji Shozenin Temple and is the first of the 33 sacred Kannon pilgrimage sites in Shonai. In contrast to Daikondo Temple (“big gold temple”) on top of Mt. Haguro (formerly Jakko Temple, Mt. Haguro and currently Sanshin-Gosaidan, Mt. Haguro), this temple is Shokondo (“small gold temple”), but came to be called Koganedo Temple (“gold temple”) after the 33 statues of the goddess of mercy, Kannon that reflect a golden color. Although tradition says it was built in 728 by the order of the Emperor Shomu, very likely it was constructed in 1193 by Minamoto no Yoritomo who appointed Sanehira Doi to build it to pray for suppression of the Fujiwara Clan in Hiraizumi. Later, in 1593 the castle lord of Sakata, Kagetsugu Amakasu and Uesugi’s vassal, Naoe Kanetsugu conducted large-scale renovations over 3 years, resulting in the Koganedo Temple of today. Legend also says there is buried treasure within the temple grounds. A 5ken (1ken=1.8m; counter used to number the gaps between pillars), 4-sided, 1-story construction with copper roofing. Mt. 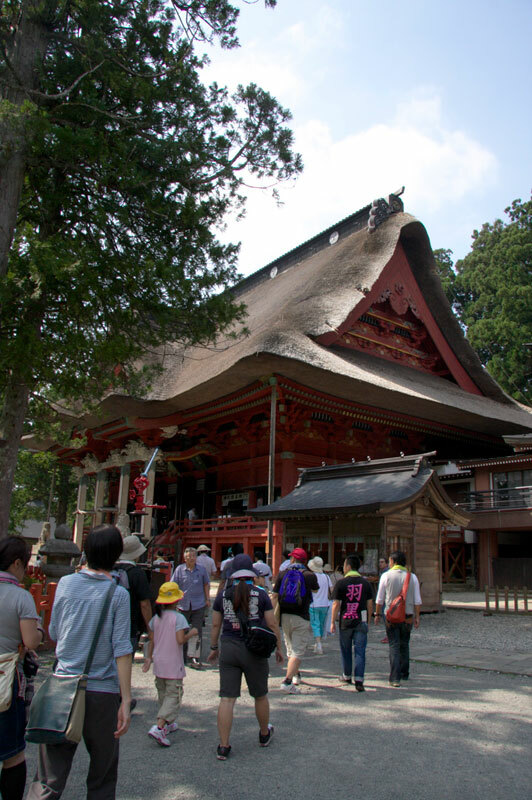 Haguro did not escape efforts in the Meiji Period to eliminate Buddhist temples and statues as the result of an edict separating the Shinto and Buddhist religions. Koganedo Temple is one of 3 existing temples that survived during the destruction of the 10 large temples that formed Mt. Haguro at the height of its golden age. The proper name is Hagurosan Chojuji Kondo. There are Buddhist images enshrined within Koganedo Temple from various eras, such as the Heian, Kamakura, Muromachi, Azuchi-Momoyama, and Edo periods, as well as 2 pairs of kongo rikishi statues (one at the main temple gate created by Kouon in 1633 and one within the hall made by Zenkei[ in 1695), a Zenbutsu object of worship that was once housed in the Five-storied Pagoda on Mt. Haguro, and 33 life-sized statues of Sho Kanzeon Bosatsu (goddess of mercy)—a rarity even in Tohoku. In addition, the Dewa Honjibutsu (original Buddhist divinity; Kannon, Amitabha, and Dainichi) of the three mountains that were in the sanctuary at Daikondo Temple (formerly Jakko Temple, Mt. Haguro and currently Sanshin-Gosaidan, Mt. Haguro) on the top of Mt. Haguro can be worshipped at Otake Dainichido Hall located within the same grounds. Designated a national important cultural property in 2000. This magnificent main shrine building is the largest wooden, thatched-roof building in Japan with a floor space of 617m2, a height of 28m, a hall of worship facade spanning approx. 26m, a length of approx. 20m, and a 2.1m-thick thatched roof. It is primarily constructed from Japanese cedar, and the interior is lacquer. The current Sanshin-Gosaidan on Mt. Haguro was so named from the Meiji Period when Dewa Sanzan became the mountains of the gods. 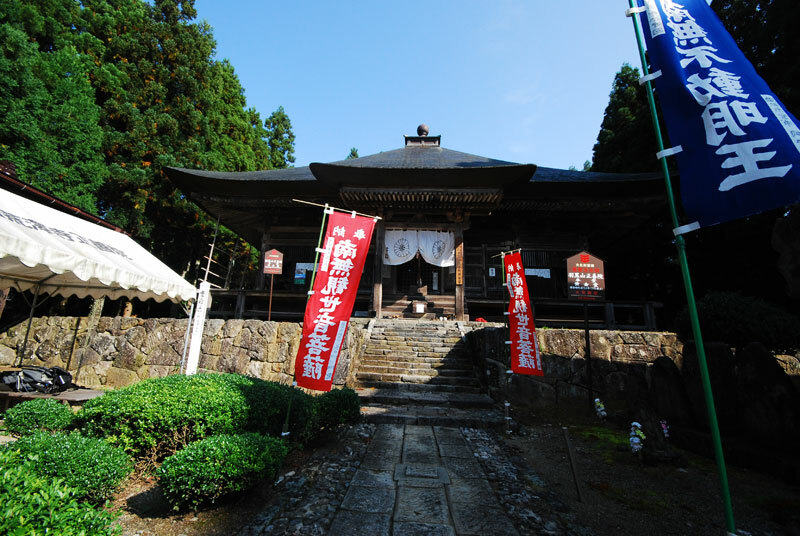 Prior to that, it was Gogendo Hall, which enshrined the Shinto and Buddhist deities of Mt. Gassan, Mt. Haguro, and Mt. Yudono. It was constructed in 1818 in the architectural style called gongen-zukuri as a temple that fused Shintoism with Buddhism. The grand building standing 28m tall with a thatched roof 2.1m thick is the only one of its kind in Tohoku. Dewa Sanzan are three mountains where Shugendo is practiced. Shugendo is a syncretization of Shintoism with Buddhism that fuses the teachings including Buddhism, Taoism, and Confucianism with the ancient Japanese mountain worship that venerates nature. In the Kamakura Period, they were called the “mountains of the eight sects of Buddhism,” and services were rendered through the Shingon and Tendai sects at Jakko Temple until they once again became Kamunabiyama, mountains where the gods reside, after the separation of Shintoism and Buddhism immediately following the Meiji Restoration. Sanshin-Gosaidan is the Daikondo (main building) of Jakko Temple, and in its long history has suffered fire on many occasions. The building standing today was reconstructed in 1818 during the Edo Period. Three gods (the god of Mt. Gassan, the god of Mt. Haguro, and the god of Mt. Yudono) are enshrined in the center of the inner sanctuary beyond the golden-colored door. In the center is Gassan Shrine, which enshrines Tsukuyomi-no-mikoto. Looking forward on the right is Ideha Shrine, which worships Uganomitama-no-mikoto and Ideha-no-kami. On the left is Yudonosan Shrine, which worships Onamuchi-no-mikoto and Sukunahikona-no-mikoto. Designated a national important cultural property in 1973. This large temple bell hung in the bell tower atop Mt. Haguro is the largest in Tohoku, measuring 1.68m in circumference, 2.85m in height, and 21.5cm in thickness. Nationally, it is said to be the 3rd largest after Todai Temple (Nara City) and Kongobu Temple (Koya, Wakayama Prefecture). This bell was said to have been cast on Mt. Haguro. 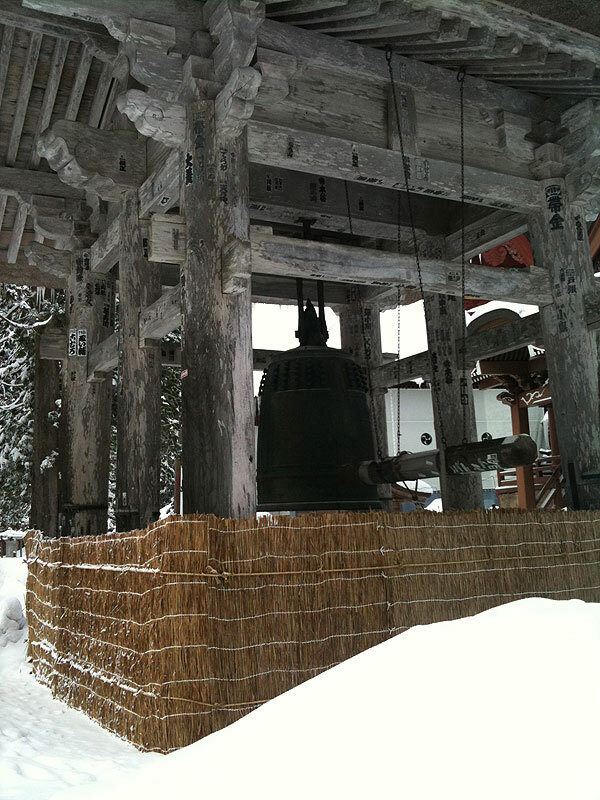 Approximately 2km to the northeast of the bell tower is a place called Kanegaoka (“bell hill”), and legend says that a caster from Oyama in Tsuruoka City, Sukeuemon Ito, was one of the craftsmen who cast the bell. The bell tower is constructed with a thatched, gabled roof that has a ridge direction of 1.8m and a span of 3.6m. Once felled by a typhoon, it was rebuilt the following year in 1618 by the third lord of the Yamagata Domain, Ienobu Mogami. It is the second oldest building on Mt. Haguro, after the national treasure, the Five-storied Pagoda. Designated a national important cultural property in 1950. 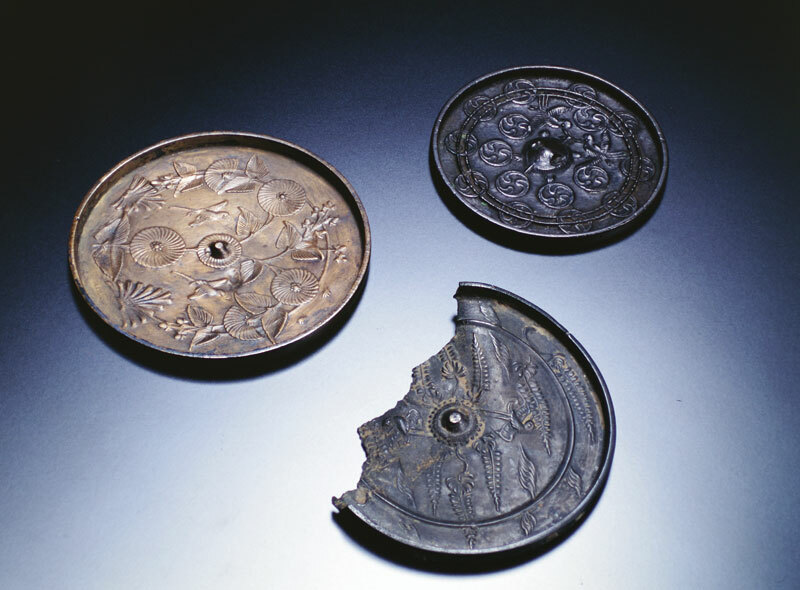 These are Haguro-kyo (Haguro mirrors) from the Heian Period until the Edo Period (unearthed at Mitarashi-ike , Mt. Haguro). The pond, Mitarashi-ike is in front of Sanshin-Gosaidan, the worship hall on the grounds of Dewa Sanzan Shrine at the peak of Mt. Haguro. It is elliptical in shape and runs east-west for 38m and north-south for 28m. It is also called Kagami-ike (Mirror Pond). There have been five or six hundred mirrors discovered in this pond, which is known throughout Japan as a place where mirrors were buried to pray for peace. Designated a national important cultural property in 1941. Mt. Gassan was home to a school of master swordsmiths active from the Kamakura Period until the Muromachi Period. It is said that they forged swords atop the sacred mountain of Gassan in Dewa Province, but in actuality it was likely somewhere in the vicinity. The creations of this school of sword making were notable for a wavy grain pattern. Straight swords were common in the sword culture. 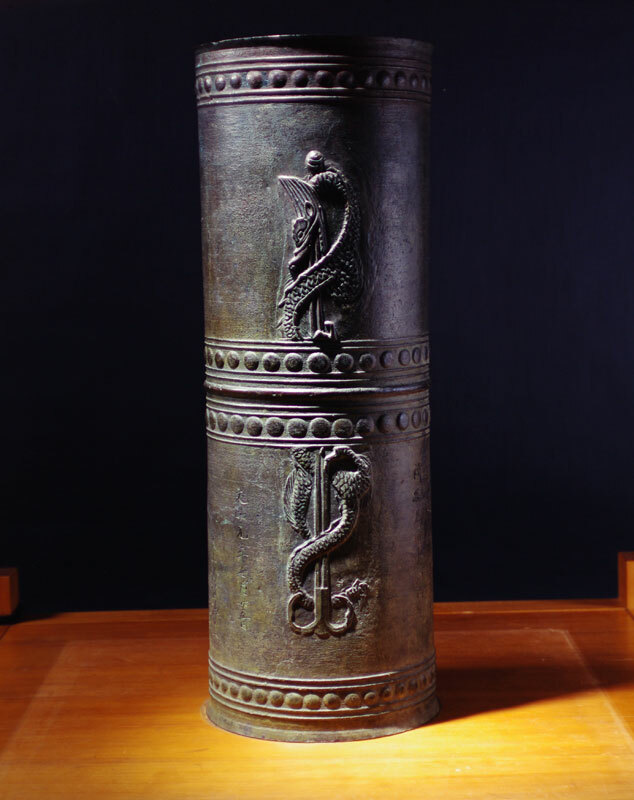 Made of bronze, it is the longest part of the lantern at 1.13m high (approx. 3m in total length). On the post is carved a picture of the Kurikara Dragon King, which symbolizes the god of fire, biting the tip of a sword. On the backside is a hollow relief straddling ties. Designated a special national monument in 1955. The front approach from Zuishin Gate is a long path of 2,446 stone steps over approx. 1.7km. 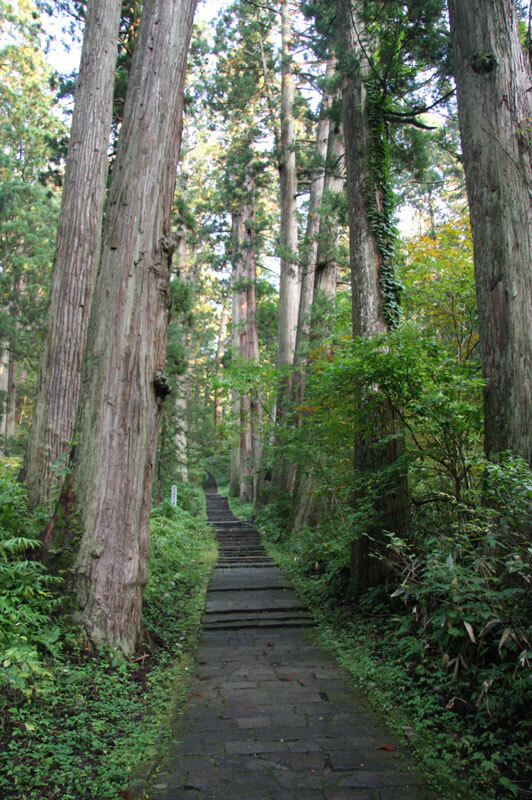 Along the path are magnificent rows of Japanese cedar trees dating back 350–500 years. The over 400 cedar trees have been designated a special national treasure. It takes about 50 minutes to walk to the mountaintop. At Ninosaka Tea House, visitors who make the trek receive a certificate attesting to the fact that they walked up the stone path (free). The stone path has 2,446 steps. 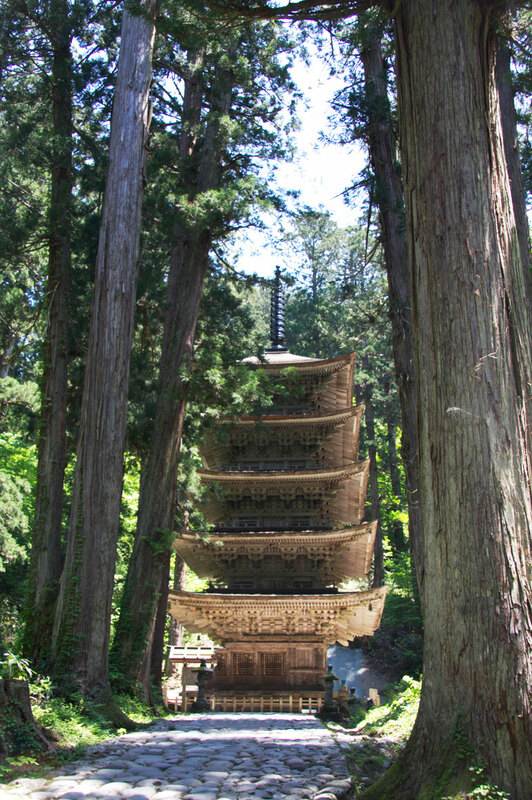 Along the way to the top, there are 33 shapes carved into the steps that include sake cups, gourds, lotus flowers, and yamabushi (mountain priests). It is said that if you find all of them, your wish will come true. Designated a special national monument in 1951. This is a giant, ancient cedar tree that is 1,000 years old and 10m in circumference. There once was a towering “grandmother” cedar tree nearby, but it was brought down by a typhoon in 1902. It is the oldest tree among the 600 or so cedar trees on the mountain. Designated a national scenic site in 1987. Gyokusenji Temple Garden was first created in the Muromachi Period (1450s) and later improved in the Edo Period (1640s) by Tenyu Betto, said to be the forefather of Mt. Haguro’s revival. 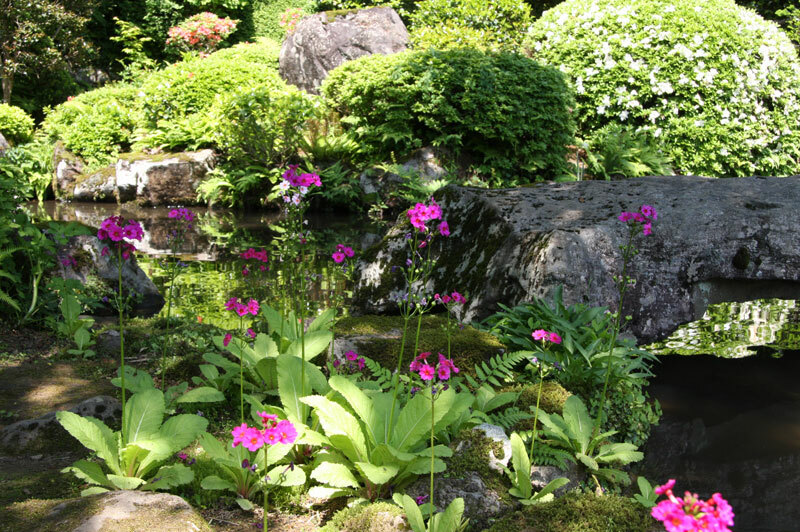 The pond-centered garden is said to be western in style, and the aged rock arrangements represent the stillness and harshness similar to that experienced by a priest of the Zen sect undergoing apprenticeship. The garden instills those who gaze upon it with a mysterious peace of mind. In 1987, it was designated a national scenic site for its importance in understanding transitions in the culture of gardens in the Tohoku region, and in recognition of its outstanding gardenscape that makes creative use of the placement of rocks on the islet, among standing stones, and in the middle of the pond. Gyokusenji Temple is enveloped in flowers throughout the four seasons and has come to be called the temple of flowers. The temple grounds are blooming with cherry blossoms in spring, azaleas, Japanese primrose, and iris in early summer, and Japanese clover and Japanese anemone in fall. Designated a national natural monument in 1951. About 400m to the right of Sannosaka along the path up Mt. Haguro is Minami-dani, where the poet Matsuo Basho stayed for six days. There, in the former garden along a low embankment of a pond there was an ancient oyamazakura (prunus sargentii) estimated to be around 300 years old. At the time of the designation, the trunk was 4.6m and at a point 2m above ground split into 2, stretching east and west. Though it was destroyed in a typhoon in 1981, sprouting saplings produce flowers each year. Designated a national natural monument in 1972. Mt. 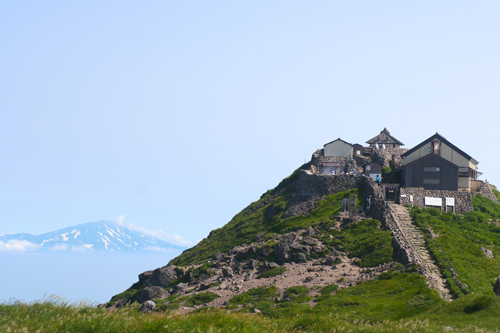 Gassan stands 1,984m above sea level at its peak and is located in Bandai-Asahi National Park, which is by and large over 1,400m above sea level. The area spanning from the 8th station to the top of Mt. Gassan has been designated a natural monument. The 8th station is wetland that has scores of large and small ponds created in peat layers in which grow carex pisiformis, a plant similar to the seeds of an ear of rice. This gave rise to the belief that the god of Mt. Gassan plants ears of rice. This area is called Mitahara (Mitagahara).